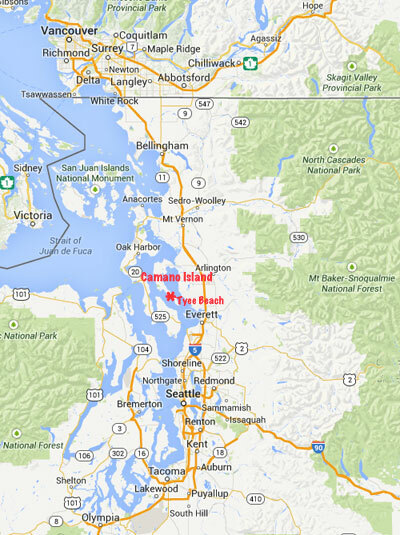 Camano Island is easy to get to. You can just drive onto it. No ferry required. It's about an hour north of Seattle and an hour south of Vancouver, BC (always depending on traffic!). The island is long and skinny, about 18 miles from north to south and about 5 miles at its widest point from east to west. 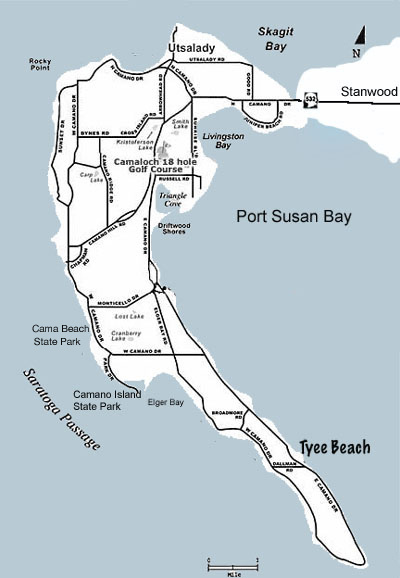 It's located between Whidbey Island and the mainland, with Port Susan Bay on the east side and Saratoga Passage on the west side and Skagit Bay to the north. The island has more than 50 miles of shoreline. If you are driving to Camano, you probably will be on Interstate 5, the major north-south freeway in Western Washington. Take exit #212 for State Route-532 (about 50 miles north of downtown Seattle) and head west through the town of Stanwood (about 5 miles from the freeway), over the Mark Clark Bridge, which crosses the Stillaguamish River, and onto Camano Island. Tyee Beach, where The Beach House at Tyee is located, is down the road less than 15 miles, towards the south end of the island. The houses here face a pebble beach and crystal clear salt water, with a forested hillside just across the one-lane road behind them. It's been called the best of both worlds. And it's hard to argue with that. When it was founded back in the 1940s, Tyee Beach Resort wasn't a resort in the Conde Nast sense of the word: it was a fishing camp, with rustic cabins located right on the beach. Fishing and crabbing were fabulous and families loved coming to Tyee for short visits or for the whole summer. Now Tyee Beach is a mix of homes large and small, full-time residences as well as vacation homes. Fishing and crabbing are still popular. Although kayaking and paddle boarding and wakeboarding are edging out water skiing and windsurfing in popularity, innertubing, jet skiing and swimming are holding their own. As they have for generations, kids still love to stand at the water's edge and skip stones. And there's no better place to sit back, relax and enjoy the view. Residents and visitors alike still love spending time at Tyee Beach.